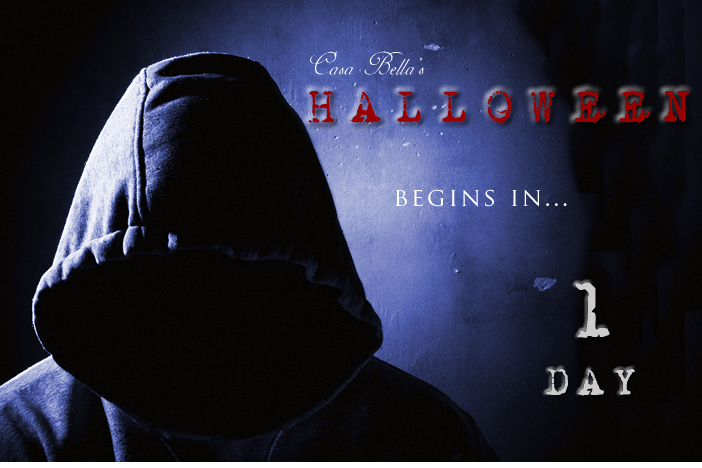 the day before the show; finally, after more than 3 months in the making (or rehearsal), Casa Bella’s Halloween is here, and what an event it will be. Who would have thought that when we started these dinner parties nearly a year ago, they’d turn into these mammoth productions, of concept, design, rehearsal and performance. They’ve moved beyond ‘dinner with friends’ and are more like ‘dinner and a show’, which each, apparently, outdoing the other. But I guess that’s all part of the process, our guests often say, “I can’t see how you’re going to top this next time”, and my response (albeit subconsciously), as a bead of sweat forms on my brow is, “nor can I”. I know that the motivation is most likely in this detail; for a non professional actor, the reward of 3 months rehearsal is to tread the boards, albeit for a few nights, for us (my sister and I), it’s to see the look on the faces of our guests, the moment they walk into the entertainment room and, not unlike children on Christmas morning, be affected by the conception and construction that came before them. I know it all sounds a bit ‘grand’ and perhaps not everybody’s cup of tea but it certainly is mine. Somebody said to me the other day, “when you get involved in something, you go all out, don’t you?” I believed the statement was a compliment but I nonetheless couldn’t help but wonder if it was some kind of an insult; as if he was saying “cor, you really do make a fuss, don’t you?” If that was the case then the answer would have been “Yes, I don’t just ‘do’ dinner.” I guess that’s always been me though, every creative project I’m involved in has to have an edge, after all, how else is one going to leave an impression? Now, I know (or truly believe) this person was actually paying me a compliment and that I was merely being paranoid but it got me thinking about who I am and why I need to embrace regular challenges in life, I guess it’s because I believe that if I don’t then I’m dead, albeit in spirit. Don’t get me wrong, there’s a lot to be said for ‘having a few friends round for dinner’, no thrills, just good food, company and conversation but, personally, I’d get bored with this after a while because, not unlike a relationship, it’d become mediocre; neither of us (host or guest) challenged out of our everyday comfort zones and encouraged to do something out of the norm, whether that be putting on a tuxedo or writing a ghost story and reading it out to a relatively intimate gathering of people only to then have it published to thousands. (Yes, this is what our guests have signed up to). Sounds scary but it’s all part of the process. A lot of effort goes into these events but our guests (well, most of them at least) don’t hold back either because they too believe in this mutually beneficial trade as it reminds us of the present actuality; we’re alive and capable of things long ago consigned to the hedonism of youth. A good example of this is February’s Casa Bella Masquerade, when we asked each of our guests to bring a talent to be performed for their fellow guests. The invite struck fear in most but the result was an evening of eclectic and untapped talent that many of our guests didn’t even think they possessed and it’s beautiful how, even now, they describe the exhilaration of the event. So, Casa Bella’s Halloween may have endured it’s own challenges; drop out guests, collapsing props, the destruction of treasured ornaments, spooky goings on, oh and sleepless nights, all for one evening but will it all be worth it…..? Check out Sunday’s a Different Angle blog post for the story and, of course, the pictures! Tammy has captured quite Eloquently the true meaning of a Casa Bella Event ,it is to purely entertaining at close Quarters . think of a Magician performing a card trick before your very Own eyes you know it is a trick but you are captivated you do not how but it has just Happened before your very eyes no seams, no joins,no waiting just a continuous flow of pleasure amongst friends who each time Excell at Entertaining their hosts and Fellow Guests alike. It may not be Everyone’s Cafe Au Lait but for The Discering Person who enjoys something different if you are fortunate Enough to be Invited to one of these Evenings ,It will be a memory to Treasure . A big fat WOW! I think you should go on Come dine with me or set up some sort of company specialising in dinner parties or set up an am dram group!